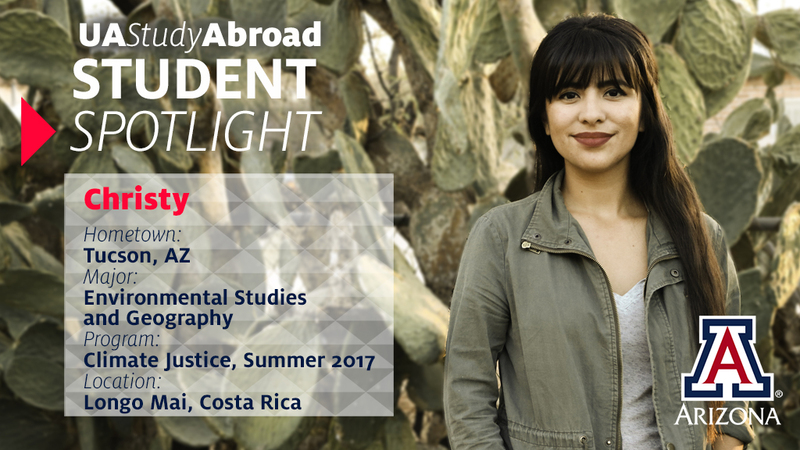 UA Study Abroad is excited to announce Christy Fierros as our latest Student Spotlight! Read on to learn about her experience in the Climate Justice program. What was the best part of your experience? We visited many different grassroots groups, communities, and individuals and listened to their experiences of working to protect the rivers, the land, and their communities. One story that I will never forget came from a woman and her son who are members of the Terraba indigenous tribe, who told us how they stopped the biggest dam in all of Central America from being built in order to protect their land and culture. The modesty, strength, and compassion they showed despite great hardships, epitomized resilience. Seeing a cloud forest and sloths was also very cool. Why did you choose this particular program? Ever since I was young, nature has been a constant source of inspiration and strength for me. As I've learned more about the political and socioeconomic forces that shape environmental problems as we see them today, my passion for the environment warped into a passion for environmental justice and political ecology. I was immediately drawn to this program once I saw that it focused on just this, the interconnections between environment and society, and the importance of community resiliency. How did it change your life? I learned what living simply really means. Longo Mai is a village that acts as both an environmental preservation and a cooperative founded on partly anti-capitalism principles. Contrary to us here, they aren't caught in a viscous cycle of consumption – life is calmer. As a result, they seemed to have much more of that highly valuable thing, which many of us in the western world wish we had more of; time. Why should other students consider this program? Since we are living in critical times of rapid social, environmental, and political change, we need more young people getting involved with cross-sector movement building. This program gives you a chance to learn from a wide range of climate justice leaders who are working toward a more just, local economy for community resiliency in the face of environmental change and political pressures. I truly believe this program is invaluable and has something to offer everyone. Any tips for students who are thinking about study abroad? If there's a program that really speaks to you, do it! Even if you think it may be impossible due to financial constraints (like I once did), there are so many resources and scholarship opportunities out there. Traveling abroad gives you a greater sense of your place in the world. At this historic moment when fierce debates over our planet’s natural resources are taking place everywhere, this program – which takes place in Tucson and in Costa Rica and is taught by climate justice leaders; water, food, and energy experts; and local economy visionaries – focuses on how personal and community resiliency are created in a time of climate change, with compassion. The program has three parts: 1) an overview of the personal and community character traits and skills necessary to bring about the cross-sector movement building, or resiliency work, taking shape around the world as the climate quickly shifts; 2) a review of the rapidly changing documentation – scientific, academic, artistic, testimonial about this movement; 3) personal stories about the lived experience of building these movements from powerful leaders, many of them young. Students will spend their days in a combination of community-based work (planting trees and gardens, installing water systems, gathering data about rivers), site visits, class discussion, and time by rivers to sit, meditate, and reflect. Learn more about the Climate Justice program. The application deadline for summer 2018 is February 25. UA Study Abroad in the Office of Global Initiatives inspires students to make learning their own adventure. We offer more than a hundred programs across dozens of countries, with offerings that span one week to one year. Start your program search here.